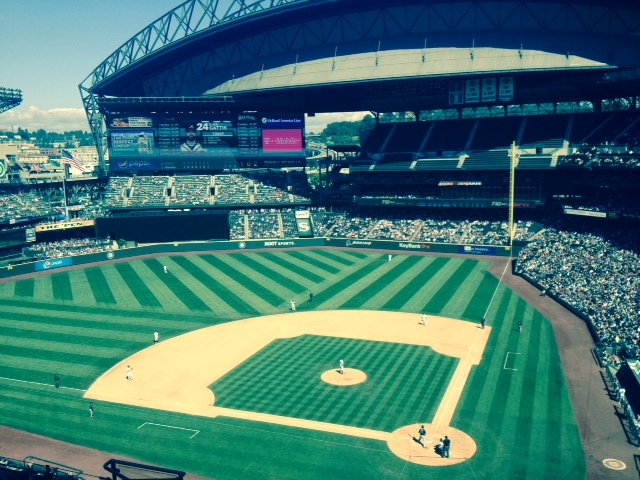 Safeco Field in the Seattle summer sunshine (especially on a WEEKDAY afternoon) . . .
Mr. Young started out on cruise control . . .
he retired the side in order (w/THREE K’s) in the first TWO innings. Then came the 3rd where he loaded the bases via THREE straight singles and then walked in a run (ugh!) and then gave up a TWO-run double. Chris hung in there, and though he threw a ton of pitches (92) he was able to post FIVE full and, ultimately (thanks to some awesome O) earn the victory. The bullpen was fully rested (since the off-day on Monday was book-ended by Kuma and King’s 7+ innings) so, maybe a good thing that they got some low leverage work in . . .
Love, love, lovin’ the DEE! * Dustin with an awesome running catch (that, frankly I though he might lose in the sun as he had a few innings earlier) . . .
Dustin Ackley takes one deep, solo shot leading off third. His 7th HR of season and third in last six games. Hustle double for Robinson Cano. Take that, Kevin Long! This entry was posted in GameDay, HOME and tagged Ackley, ATL, attended, Beimel, Cano, Furbush, Jackson, Leone, Medina, Morrison, Seager, Young. Bookmark the permalink.